We both got a little down in Bangkok. The travel burnout of 10+ months on the road combined with the depression of spending the holidays away from home, which combined with the jetlag and culture shock that accompanied our arrival in Southeast Asia. Our spirits, shall we say, were not soaring. The subject of scrapping this leg of our trip and returning home right away began to crop up. We decided that what we needed was a beach. We needed to luxuriate among white sands and turquoise waters. We needed to replace the omnipresent roaring of engines and honking of horns with the gentle sounds of surf lapping against shore. Fortunately, of course, beaches are something that Thailand does quite well. Ko Chang Marine National Park is a chain of islands off of Thailand's southeast coast, near the Cambodian border. 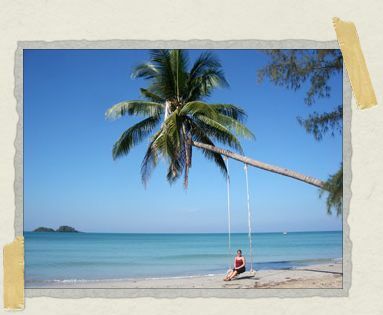 The largest island of the chain, mighty Ko Chang itself, is a mountainous stretch of dense tropical rainforest surrounded by soft sandy beaches and picture-postcard bays and inlets. Most of the island is (currently) protected from development due to its designation as a national park, and the forests of the interior are some of the best-preserved in Southeast Asia. The west coast is where all the good beaches are, stretching from White Sands beach in the north (where you can pop into the 7-Eleven for a Gatorade on your way to the internet cafe) to Lonely Beach in the south (becoming less lonely every day, but you can still find a vast stretch of beach there all to yourself). We set ourselves up about halfway down, in a place called Ao Klong Prao ("Coconut Bay"), close to restaurants and the internet but away from the crowds. 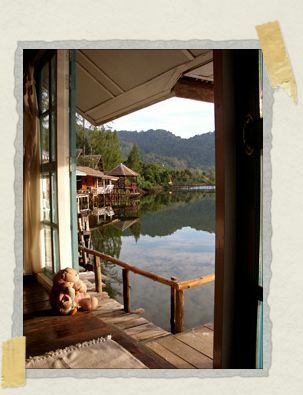 *Our stay in this idyllic bungalow was made possible through the loving support of our friend Koreen. Thank you Koreen, so so much, for helping us find a place that we could call home. The beach is just lovely, long and quiet and covered in sand the color and texture of baby powder. The waters of the Gulf of Thailand are sumptuously warm, as warm as bath water, and you can wade about 500m out into them before you can't touch the bottom anymore. And that's when you get the best part. I was lazing out in the water, half-asleep and tremendously content. Jessica was floating on the raft a few feet away, and I glanced over at her. And then I noticed, as if for the first time, the view I was surrounded by. Ridiculously far off to my left was Ko Chang, from this distance all mountainous jungle and palm-tree-lined beaches. Ridiculously nearby to my right were a small clutch of other islands, a dozen of them, dotting the turquoise waters from horizon to horizon. There was perhaps a dozen people on the beach, and only one or two others in the water. It was precisely the private little paradise we'd been looking for. That evening, we sat on the large front deck of our bungalow, watching the sun set behind the palm trees on the other side of the lagoon and enjoying a couple of Chang beers. Tropical birds were calling from the forest, and their voices were joined by a chorus of frogs from the lagoon. And other than that, there was no sound at all. And we found ourselves thinking that maybe a few more months of this wouldn't be so bad after all. Some people reading this post may notice it's the first time since Argentina that we've mentioned how we've spent money donated to our trip. We've been planning to save a lot of our donations towards Southeast Asia where those donations will go the furthest. There are a few donations we specifically used in South America, but we haven't written about those yet and plan to do so when we get home. But no worries: we definitely will not forget anyone! mmmmm. it does nicely just to read about it. I was so inspired by your post I tried to get Koreen to pay my house payment. She wasnt having it though. The view is gorgeous and the feeling recognizable. Though Bangkok is an amazing city it has a crazy amount of energy and we too were happy to leave it for quieter beaches. I love reading your travels. Thanks for the post card.